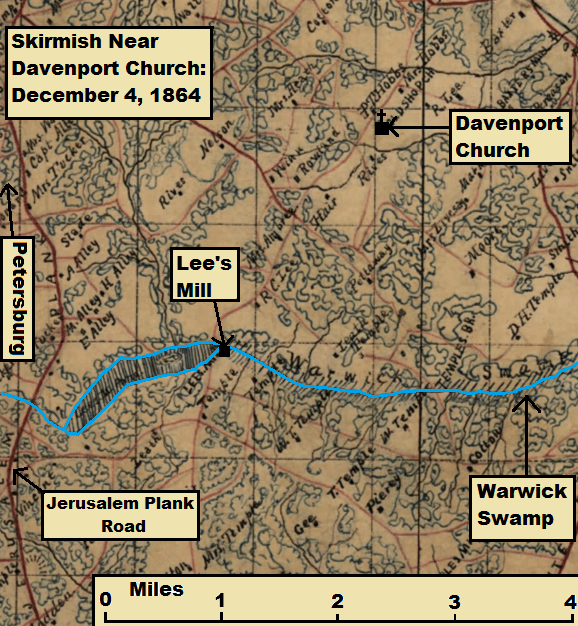 On December 4, 1864, 150 years ago today, a small portion of the 13th Pennsylvania Cavalry found itself attacked near Davenport (or Old Shop) Church, about 2 ½ miles northeast of Lee’s Mill and roughly three miles north of Warwick Swamp. At approximately 2 in the morning, a party of Confederates, estimated to be about 30 strong, hit 25 men and 1 officer of the 13th while they were stationed in the area as a forward picket line. The Confederates got the better of the exchange, inflicting 1 killed, 9 wounded, and 5 captured, a total of 15. Only ten men escaped to report the affair. In addition, the Confederates captured 12 desperately needed horses. The Confederates had managed to cross Warwick Swamp and slipped in between the thin picket posts to surprise this particularly unlucky group of Yankee troopers. Unfortunately, I don’t have much more on what must have been a very brief affair. If you know the identity of the Confederates which attacked this night, please use the Contact link in the upper portion of the screen.